It is night. You are high above ground, overlooking what appears to be some sort of park. Too far away to make out much. Go closer. There is a group of men, sleeping around a poorly-tended fire. A few yards away from them is another man. At first he seems to be sleeping too, bent over, but now you notice his body convulsing, like he is in agony. After a little while, the man ceases his prostrations, stands, and shakes himself off. Whatever was afflicting him is no more, and you can make out a calm, a peace that has come over him. He makes his way over to the others, and rouses them. Over a small hill come many lights, what appear to be scores of men holding torches. Several are marching; must be soldiers. Several are walking together, talking. One is conspicuously apart from the others. He makes his way, head bowed, shoulders hunched. Even from this distance, he is clearly a Man Alone. You see the two groups now, eye to eye. The scene is tense, as everyone is just standing there waiting. The Man Alone walks up to the man who had been in agony, and says something to him. A kiss is exchanged. Bedlam erupts as the soldiers move to take the man as the others bar the way. Swords are pulled and blood is spilled, but the man who was kissed says something and all activity ceases. He willingly is put in chains by the soldiers and led away. The others scatter in different directions, and soon the area is quiet once again. The only man left is that Man Alone, now sitting on the ground watching the departing crowd. You might have recognized the Garden of Gethsemane. You might possibly have figured out who the man was bent over and shaking on the ground, and finally led away by the soldiers in chains. Finally, you might have noticed the man left behind, sitting there, gaze riveted to the departing crowd and the man he just betrayed. The most reviled figure in all of human history. Ladies and Gentlemen, I give you Judas Iscariot. The question then is posed: why did Judas betray Jesus? For such an important catalyst, very little is known about him. Ioudas Iscariot, which translated from the Greek means Judah, man of Kerioth. He was the only disciple not from Galilee (maybe that has something to do with it). He is also described as the group’s treasurer, although this label was used to accuse Judas of hypocrisy and thievery. For centuries art and literature have tried to answer the question of why Judas would betray his Master. The 1973 movie Jesus Christ Superstar shows Judas feeling that Jesus has become a cult of personality and had gotten off-message, as Judas tells Jesus, “You’ve begun to matter more than the things you say.” The 1960 film King of Kings takes another track, with Judas as a double agent in an underground army with Barabbas and trying to start a rebellion. Books have also tried to explain the betrayal. Two novels had the same idea, the 1912 Diary of Judas Iscariot of the Gospel According to Judas and the 1977 I Judas, both which present an average Jew looking for a King and a Conqueror, only to be bitterly disappointed at finding a carpenter and a man obsessed with his own death. 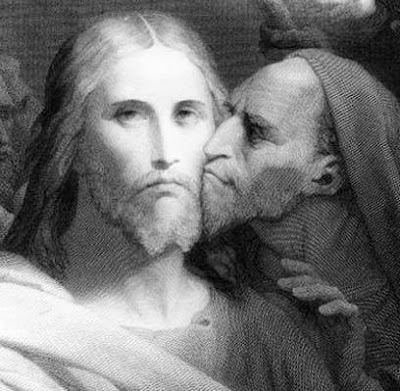 Dante condemned Judas to the 9th Circle of Hell without much comment, but Michael McInnis argues in A Secret History of Judas Iscariot that the Nag Hammadi books portray a Judas that history has vastly misunderstood. That the one called Judas Iscariot did love the Master, but began to see that his love went unrequited, and so hatred did grow in his heart. Jenner had several poems—some of them quite long—detailing Judas’s love and then obsession toward Jesus, all leading to the betrayal. Shakespeare was bewitched by this, and saw it as rich material for his greatest tragedy yet. He began work on Judas Iscariot, convinced this was the work to bring him world acclaim (which had thus far eluded him). Word got to King James of this endeavor, but like a game of Telephone, Shakespeare’s intent had been twisted. The King heard that Shakespeare not only meant to write a play where Judas was a homosexual, but that Jesus rejected this love not because of his mission to save the world, but because Jesus was himself in love with Mary Magdalene. There is no evidence Shakespeare intended for his play to go this way, but word came down from on high, and suddenly all of Shakespeare’s funding dried up, and he was forced to move on to another tale of betrayal (which would become Othello). Recently a story was unearthed, giving an alternative explanation to the Judas Question. The author is unknown, but he took some of Niccoli Jenner’s poetry and interlaced it with his own story. The tale was passed down orally for several generations, before finally a version made print. A translation (from the Latin) is presented below. It might help to read it aloud, as was intended. Come, now children, to see the man, born cradled in the palm of God’s hand. Over Mount Hebron, through the parching desert, across the streams and valleys that have sustained us all these years since the time of Abraham our Father. To a small village in Judah we journey, a town called Kerioth. There one has been born they say, as a miracle before the LORD. He has been given a name to praise the land that bore him, the land which holds his coming, his arrival, his promise, his hope. Hear the whispers in the crowd, as they talk of the miracle-child. Could he be the one? Messiach…the Messiah, the one chosen to lead. Other towns, other lands, all have their stories, their legends, that they might be the one, that they might bring forth Messiach, the Messiah. Kerioth is no different, and now the town is alive, alive with hope in their hearts. See the boy, growing up as a child. He is told he is different; he is special, though none will say why. His family is poor, but he is always given the best, and he comes to accept this and expect it, as is no more than his due. Sit alongside him in school, older now, well muscled and handsome. Listen to the words of the Rabbi, as he teaches of the foretold one, the one born of the House of David, who will rebuild them all into a great nation. He hears and reads these sacred words, and they have a meaning to him denied the others. Not all the details match up, but did not the Rabbi say, ‘Difficult are the teachings of the Torah and the Prophets to understand, and wise is the man who discerns them’? He will be that man. He is that man. He has known for many years—has he not?—that he was put here for a purpose. He was told this, yes, but he did not start to believe until he felt the stirrings within his heart, that small quiet voice that he knows is the LORD. He knows he is meant for something great. Messiach? The Messiah? He will not allow these words to be spoken in his presence, but in his heart he believes. See now, as the man prepares to leave Kerioth for Jerusalem. He carries with him the hopes and dreams of the entire town, and to honor them, he takes the town’s name as his own. A donkey has been given to him to make his journey. The townsfolk have gone together, sacrificing as they can, going hungry when necessary, to give him money to live in Jerusalem. They have collected and saved thirty pieces of silver. To him, is it another sign, for did not Zechariah the Prophet write, of the Shepard, “’If it’s alright with you, pay me my wages, but if it is not, don’t.’ And they paid me my wages—thirty pieces of silver.”2 It is a sign that he is to be a Shepherd of Men. Thus Judah of Kerioth rides out. To rebuild this nation, no matter what cost. Feel now, the heartbreak of a man whose dreams have shattered. Jerusalem, his plans to be a Shepherd of Men; the words are now bitter ashes in his mouth. He had grown up poor, but had been accustomed to privilege; provided by the sacrifice of those around him. With no sense of the real world, those thirty pieces of silver slipped through his fingers like water. Now he is destitute, forced to take any job no matter how degrading just to eat, and to have a place to sleep. He no longer hears the LORD’s voice within his heart, and he begins to wonder if he ever did. Be there, on his shoulder, the day he decides to take his own life. He has failed to bring forth a new nation. He has shamed his town and his people, and there is no hope left. Smell the buds on the tree, the fibers of the rope, as he prepares to quit the journey. Hear the crowd coming towards him, this place he picked to be alone, to complete his shame. The frustration of not being allowed solitude, for this final ignominy. The crowd approaches, following a man who seems to know where he is going. The man looks at Judah of Kerioth—now called Judas Iscariot—and Judas feels the LORD return. Witness the man approach and speak to Judas. “Come and follow Me.” He says. Judas barely hears him. All he can feel is the voice within his heart. The LORD has returned to him, and he once again has purpose. 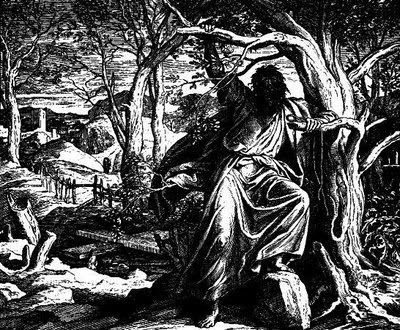 Judas nods and joins the crowd, as they turn and walk away from that tree. Live with this group—called disciples—as they journey around the countryside with the Master. Be there when they shun Judas for not being one of them. He overcomes that, and in time works his way up to holding the Coin. At first, he is proud, to earn the trust of his leader and the group. But—just being near all this money is tempting. He begins to take—just a little bit—here and there. After all, wasn’t he chosen by God for great things? Should not he have nicer things than the others? The best times are spent with the Master. His name is Jesu bar Joseph, but no one speaks that name. Judas calls him Rabbi or Master, for this man has many things to teach. It brings Judas back to a time when the world seemed fresh and there was nothing he could not do. Judas and the Rabbi spend many hours in deep discussion, speaking of the Kingdom of God. The others don’t care for this; to them it’s miracles of healing and wine, but Judas knows this is the plan of God, the voice in his heart, and the Master loves him best for his interest. Watch Judas over the months, as the idea takes hold that Jesu bar Joseph—the one they call The Master—thinks HE is Messiach, the Messiah, the Christ. Is this what God has for Judas, to be a follower of the Christ? This is difficult for Judas, raised to believe he was the chosen one. If it serves God’s purpose, if it’s God’s will, Judas can live with that, though, can’t he? Be there the moment he decides he cannot. God the Father would not put this purpose within him, this voice in his heart, if he was to be a follower! No, the only answer is that Jesu is the impostor, and Judas is the chosen one. There is nothing left, but what must be done. So he must be dealt with, so must they all. Ride with Judas into Jerusalem as The Master is accorded all glory and honor and praise. The people shout “Hosanna!” and wave palms in tribute to this conquering hero—or so they think. Feel the rage seethe within Judas. The voice in his heart tells him he should be the one. This praise should be his. The disciples are sent out into the city, which gives Judas time; time to think and to plot. Feel the sweat running down his back as Judas approaches the high priests. He knows they hate the Master—after all, the Master has made fools of them so often—and they wish the Master imprisoned or dead. Touch the flickering shadows by candlelight as the high priests meet with Judas in secret. A delicate game ensues, both sides wary of a trap. An offer is made. “How much?” Judas asks. The priests share a look. Thirty pieces of silver, they say. A slow smile spreads across his face. This is the final sign from God. Climb the stairs up that upper room, for the Passover meal. The Master—who often speaks of death—seems more preoccupied with it than normal. He tells them the bread and the wine represents Him, and the blasphemy is enough to make Judas want to throw up. Then, as the meal is finished, The Master looks directly at Judas, and says, “What you must do, do quickly.” A panic seizes his heart. Can the Master know? Has he been out maneuvered? In a fog, Judas stumbles from the upper room. Feel the weight on Judas’s shoulders as he walks with the soldiers to the spot he knows the Master will be. What should be his own triumphant march is instead silent and foreboding. Judas can feel the disgust rolling off the others in waves. Even as they come to arrest the Master, his Master, they have no use for a traitor. Look into the Master’s eyes as the crowd approaches. 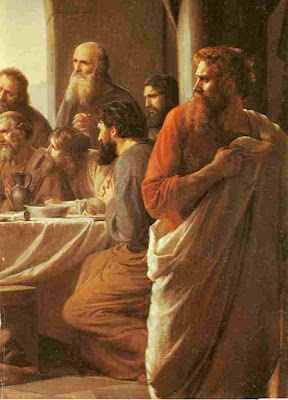 He looks sad and resigned, and as he gazes at Judas there is pity. NO! there is not to be pity on this occasion, when Judas takes his rightful place as Messiach, the Messiah, the Christ. This final burst of anger gives Judas the momentum to step up to the Master. He grabs the Master by the shoulders and says, “Rabbi.”—in tribute, in mocking; even he’s not sure. 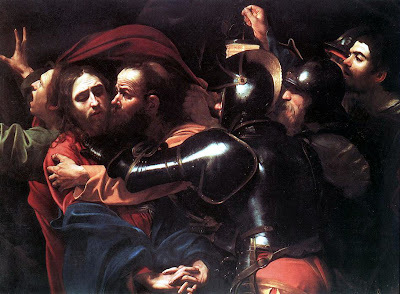 The Master looks at him and says, “Friend.” Judas kisses the Master, and It Is finished. Of the bedlam that comes after, Judas is barely aware. It is if all the air in the world has been sucked out. Judas can barely breathe, and he sits down hard, watching them drag The Master—his Master—away. Nothing is as it should be. Nothing seems right. Become aware—the same moment he does—of the small voice speaking once again in Judas’s heart. It is a relief, and a comfort, to know that through all this difficulty, God was there all along. Hear the voice as it speaks to him: “You have fulfilled your purpose. You have betrayed and condemned he who would save the world.” No. This cannot be possible. It is Judas who is to save the world. It is Judas who did what must be done. “Yes, my child,” says the voice. “You did what must be done. Victory is at hand. But not your victory. For what you did, it would be better if you were never born.” And the voice is silent once more. Run—madly—along with Judas, as he dashes through the streets. Maybe he can still stop this. Breathless he arrives at the meeting place of the high priests. Without warning he bursts in on them. “I have condemned an innocent man!” he cries. “You must take back this money, and stop this injustice!” they look at him indifferently. That is your problem, they say, and turn away. The coins burn like fire in Judas’s hands. He runs to the temple and throws his precious thirty pieces of silver—his final sign—into the building and stumbles away. It is no good, as the blood guilt now hammers him from all sides. It is he who has condemned his Master, the man who saved him from suicide, who took him in and gave him a place of honor, who talked with him long into the night about the Kingdom and the Father. Judas has betrayed all of that with a kiss, for his precious thirty pieces of silver. Smell the buds on the tree, and the fibers of the rope. Everyone is in Jerusalem for the trial of the millennium. At last there is solitude. So die he did, but on a tree that swings. 1 The title is Latin for 30 Silver, and in case you were wondering, the “G” sounds are hard.